The Black Madonna or Black Virgin is an ancient aspect of Mary revered as sacred across many cultures of the world. She is worshipped in caves, underground chambers and dark, hidden places. She represents the darkness of the void and the womb and the dark side of the divine and the feminine. She is virtually the polar opposite of the image of the purity of Virgin Mary. (It is an interesting fact that there are Black Madonna statues at many places sacred to Mary Magdalene) The Black Madonna can be regarded as that which is hidden and dark or that which is hidden in the dark shadows. She holds the sacred image of our wholeness by reflecting the dark shadow of our collective and personal consciousness. She also represents pain and suffering and death, but she is a tremendous agent of change and transformation. That is one of the meanings of her dark countenance. She is the one who entices you down into the painful depths of your desires and passions only to bring you face to face with yourself in the mirror of her all-encompassing divinity. Shrines and holy places dedicated to the Black Madonna are known to have been placed on power points of the earth’s energy ley lines. This shrine shows the Madonna on the Pillar in the Cathedral of Notre Dame de Chartres. Until my second-last visit to the Madonna on the Pillar she was a Black Madonna. But recent renovations have turned the Black Madonna into a milky-white doll-like version of the once powerful Black Madonna. This miniature statue still shows the Black Madonna in her previous appearance and clothing and the Cathedral of Chartres as it once was, veiled with mystery and tradition. 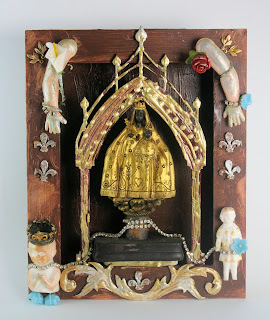 On the shrine of the Black Madonna we see the arms of Our Lady at the top, with the red rose and white lily of alchemy tied onto the arms demonstrating that she holds us in an equal embrace, body and spirit alike. Religion often regards this world and its physical pleasures and desires as the world of the devil. All religion shy away from the shadows and only see the light as ‘good’ or ‘positive’. Black is usually regarded as a ‘negative’ and the colour of death and worse. Wherever there is light, there will be a shadow and the shadow plays a very important role in the wholeness or holiness of the psyche and soul. If we never look into the shadows, we can never know who we are; we will then become stuck in the idea of who we think we are only and the depths of our being will never be plumbed. Without the darkness of the night our nervous systems cannot completely come to rest in order for the body and mind to regenerate itself. How would the fetus gestate without the darkness of the womb? How would the human heart come to know true compassion and empathy for another’s suffering without entering the darkness of the cave of loss and pain? Traditionally this card is the ‘Devil’ card. The name Lucifer has become accepted as a name of the devil or the fallen angel in Isaiah 14 of the Old Testament, especially because of a sermon by Pope Gregory the Great (540-604 AD) and the poem Paradise Lost by John Milton. The name Lucifer literally means ‘light bringer’ or bringer of light. ‘Bringing light’ is derived from the Latin lux which means ‘light’ and ‘ferre’ which means ‘to bring’. In Latin Lucifer originally referred to the morning star, Venus, or the Bringer of the Dawn. So here we have the goddess Venus, the morning star, directly connected to the Christian idea of the devil. There is a direct connection between Venus goddess of love and the astrological ruler of Virgo (virgin) and Mary, virgin-mother of the child of love. In this shrine the Black Madonna is the bringer of light into the darkness of pain and ignorance. ‘Enlightened’ means to bring light to the darkness of an uninformed mind and I would add that it means to bring the light of awareness and insight into the heart of humanity. Without the darkness there would be no need for the light and conversely, the light will be completely blinding without the darkness. When you receive this card, take a moment and see what your personal fear-based beliefs are. You have the power to free yourself from the chains that tie you to your present circumstances. Speak to others, read books and become informed: there are different perspectives to your self-limiting one.